City Eyez is a leading service provider in the IT industry, providing the best of facilities at competitive market rates. However, recent detection of misuse of our services have compelled us to take action against the violating clients and also lay down a few terms and conditions. All disputes are subject to Bangalore – INDIA , jurisdiction only. 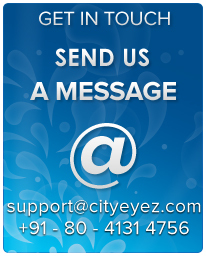 There is no provision of refund in City Eyez for any products under any circumstances. Hereby we would like to update that we have stopped all kinds of instant order activation of hosting and instant registration of domains. We have taken this step due to various fraud and hacking activities are going on in cyber world. Please ignore such type of wordings if it is mentioned in any WebPages in our website. We have to check manually the payment, domain's availability and all the credentials of the client to activate any order or register any domain. The order activation and domain registration will or might take little more time due to all kinds verifications and manual checking of the date provided by the client for the same. We hope you can understand the emergency and criticality of the cyber law and will co-operate us to the maximum level. If you have made the payment by the payment gateway and the payment gateway company has declared your payment as fraud then your account will be suspended and the domain name will be deleted immediately with out any prior notice. if you are making the payment by offline once again or you are clearing your payment by speaking with payment gateway company then we will reactive the hosting and reregister the domain if the domain name is available. Reregistration and hosting activation will be done after getting the payment confirmation only. With in this time if the domain will registered by any other company then City Eyez will not be liable or responsible for that loses. For plan details and services provided by City Eyez , please refer to the website as the most valid reference. Any commitment made by our employees over chat/phone/mail or by any other mode, which is not mentioned in our website, will not be abided. City Eyez would like to announce that any one mis-behave or using abuse languages to our employee then we will suspend or delete his/her account without any priority notice, and he will not get any refund and further support from City Eyez any point of time. For this City Eyez is not responsible. City Eyez have full rights to take action against that client/visitor. Client/Visitor has to pay Rs.5000/- or 100 USD fine or penalty for each abuse word. If you have taken any free domain from us with any package, then at the time of changing the server from City Eyez, you need pay the domain price extra. If you are hosting your domain in any other server with out informing to our billing team by raising a ticket then you must have to pay 5 times more of the domain price. Please take the back up of all your data before changing Name Server (DNS) of your Domain. We will delete all your data automatically if you will change your Name Sever. To reduce server burden we will delete all data of the Domain which name server is not pointing to our server. So City Eyez will not responsible for any loss of data if you changed Name Server of your Domain for single time also. If any client is not using the hosting service from City Eyez, it is mandatory for the client to send the cancellation request in company latter head to billing department by post or courier. Failing with the same City Eyez will be charging the renewal amount every year. Hereby we would like to update that City Eyez will not be responsible if any one else book the domain globally within the period of order activation. If any domain gets registered else where globally with in that period and payment is done you can avail other domain name. There will not be any refund for the same. It is the sole responsibility of the customer and not City Eyez and if once order is activated then payment cant be refund under any circumstance. If City Eyez is not having customers correct contact detail and phone number then City Eyez is having full rights to suspend and delete the account with out any intimation. Before any order activation City Eyez is having ful rights to verify the clients. Any issue which is not related to server and can be solved by the customer himself then it will be charge 99/- per minute if its handling by City Eyez. If any client knowingly and intentionally misusing the manpower, resources of company or time of any support employee of City Eyez then the client has to pay fine of 99/- per minute with late fee of 500/- per month. The same rule is applicable even if the problem from client side is there and Client is wasting unnecessary time of our employee. If you are uploading audio and video file and heavy size file then you have to pay penalty per MB 500 per month. All issue will be respond on the basis of Que. If you need first respond then place a order for Assign an Account Exec as a add-on product. As per the website content and Package mentioned in the City Eyez website, at the time of order placed, if any client is using more than the specified limit in his package for his domain then the client is entitled to pay the fine of TEN times more of the amount which is mentioned in the extra resource page with late fee of 15% of high usage price per month. Before using high resources, you have to upgrade your package. After used more resources, you cannot change or upgrade the package. First you have to clear all your old dues of over usage / renewal and then you can change the package. After the expiry of your domain, if you did not renew your package from us or you moved your website from City Eyez then also you have to pay the fee of high resources used with last pending fee if any. Spamming, Copyright infringement, Illegal contents are strictly prohibited. If found violating a charge of 50,000 will be levied as penalty. If any customer violates the company's policies in site transfer or misuse of bandwidth is preheated, City Eyez can decrease its allotted Traffic quota or suspended his account with out any prior notice.